Father’s Day is just past and I have thoroughly enjoyed my gift from Highland. I was cruising around on the web site and I came across a set of DVDs called “Hands”. Hands have always been a topic of interest to me. My family had a dairy farm when I was growing up and we did a lot of stuff outside and subjected our hands to a lot of abuse. When I think of my father, one thing I carry with me that reminds me of my father is that little bit of skin between the thumb and the first finger of my hands. My Dad’s hands were always worn and cracked and that bit of skin (there’s probably a name for it) was characteristic of him. When I work outside in cold weather, my hands crack and split as his hands did, and that little connection with him now gone for nearly fifty years, reappears on me. I show it to people who may remember him as I do. 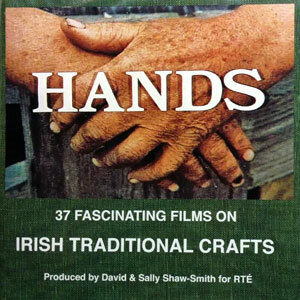 “Hands” is a series of documentary films made in Ireland during the 1980’s. They document traditional Irish crafts and craftspeople, some of which have disappeared by now, I’m sure. There are 37 videos on many different subjects ranging from patchwork and lace to hurl making to bookbinding and bespoke handmade shoes. I have a problem in wanting to do everything I see, and when I watch these films I am checking off the tools to see which ones I don’t already have. Question is whether it is worth while buying the tools and spending the time it takes to get really good at some of these trades. These people make it look so easy, probably because they have been doing it for generations. I mean how long does it take to learn to be a cooper anyway? One thing which I really enjoyed was how the craftspeople all took the filming so seriously. I noticed that they all dressed for the occasion. Even in the one where they are making clay pipe for sewers, which has to be an incredibly dirty process, they all wore a nice tweed jacket — almost as if the boss said, all right we are going to be in the movies tomorrow, be sure you look nice. All in all, a great series of films. My favorites so far, coopering, bookbinders, and the shoemaker. I looked up the shoemaker on line and they are still in business. You can order your own pair of bespoke handmade shoes for about 200 pounds for the first measurement and custom lasts, and then after that, it will cost you about 500 pounds for a pair of what they say are the best fitting shoes you will ever have. I’m glad they are still out there. I watched this on RTE as a boy in Ireland. Not all the old skills are lost they are just rare now. The series is truly wonderful. Thanks for bringing it to a global audience.